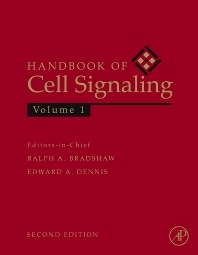 Handbook of Cell Signaling, Three-Volume Set, 2e, is a comprehensive work covering all aspects of intracellular signal processing, including extra/intracellular membrane receptors, signal transduction, gene expression/translation, and cellular/organotypic signal responses. The second edition is an up-to-date, expanded reference with each section edited by a recognized expert in the field. Tabular and well illustrated, the Handbook will serve as an in-depth reference for this complex and evolving field. Handbook of Cell Signaling, 2/e will appeal to a broad, cross-disciplinary audience interested in the structure, biochemistry, molecular biology and pathology of cellular effectors. Ralph A. Bradshaw: University of California, San Francisco Professor of Chemistry and Pharmaceutical Chemistry and Deputy Director of the Mass Spectrometry Facility; also Professor Emeritus of the Dept of Physiology & Biophysics, UC Irvine Bradshaw is an emeritus member of the Board of Directors of the Keystone Symposia on Molecular and Cellular Biology and Co-editor of Molecular and Cellular Proteomics. His research interests are in the area of polypeptide growth factors and their receptors, cell signaling, N-terminal processing of proteins and proteomics. He has published over 300 articles in these and related areas. University of California at San Diego, La Jolla, CA, U.S.A.